Fill out the form on the right for a glimpse at the journey your mugs take as they are handcrafted by Sunset Hill Stoneware's skilled potters. The free step-by-step guide “How Our Mugs Are Made” offers a complete walkthrough of what happens before your mugs arrive at your door. Our handcrafted pottery is just that—crafted entirely by hand. No slip casts. No mug molds. No automation. 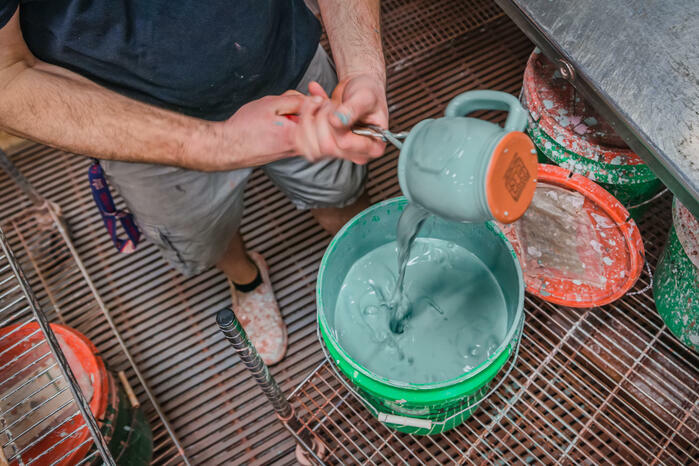 This is how we produce the finest-quality custom stoneware in America’s cleanest, greenest pottery facility. completed by our talented team. Our potters craft every mug, stein and crock by hand on pottery wheels. There is no automation. This handmade approach helps us produce top-quality custom stoneware in one of the cleanest, greenest pottery facilities in America. While no two pieces of stoneware are exactly alike, all of our pottery is handcrafted on pottery wheels for consistent uniformity. Your mugs will be fired in our kilns twice. The first round in the kilns allows them to dry and mature to the point where the clay fuses and hardens. The second time in the kiln comes after the mugs have been glazed, when they are fired at 2,200°F. The high firing temperature fuses the glaze to the clay for permanent durability, and makes your mug dishwasher, microwave and oven-safe. You'll have over 60 dynamic glazes to choose from in both single and two-tone colors. All of our glazes and clay are nontoxic and lead-free, making them safe for daily use. 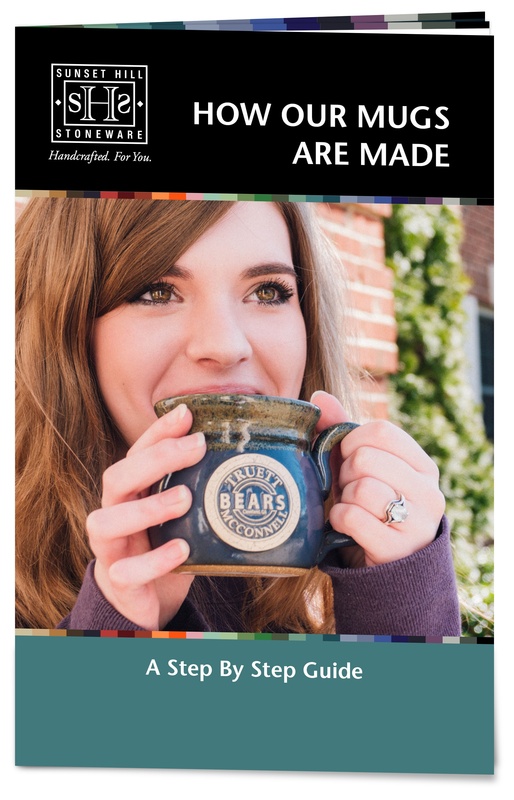 Combined with your custom design placed on the center of the mugs on a clay medallion, your mugs will stand out as a work of art that promotes your brand or cause. To receive this free guide and take a more detailed look behind the curtain at Sunset Hill Stoneware, fill out the form with your email address, plus your name and the name of your company if you'd like.